The Chief of Naval Operations (CNO) is the highest ranking officer and professional head of the United States Navy. The position is a statutory office (10 U.S.C. § 5033) held by a four-star admiral who is a military adviser and deputy to the Secretary of the Navy. In a separate capacity as a member of the Joint Chiefs of Staff (10 U.S.C. § 151) the CNO is a military adviser to the National Security Council, the Homeland Security Council, the Secretary of Defense, and the President. The current Chief of Naval Operations is Admiral John M. Richardson. Despite the title, the CNO does not have operational command authority over Naval forces. The CNO is an administrative position based in the Pentagon, and exercises supervision of Navy organizations as the designee of the Secretary of the Navy. Operational command of naval forces falls within the purview of the Combatant Commanders who report to the Secretary of Defense. The Chief of Naval Operations (CNO) is typically the highest-ranking officer on active duty in the U.S. Navy unless the Chairman and/or the Vice Chairman of the Joint Chiefs of Staff are naval officers. As per 10 U.S.C. § 5035, whenever there is a vacancy for the Chief of Naval Operations or during the absence or disability of the Chief of Naval Operations, and unless the President directs otherwise, the Vice Chief of Naval Operations performs the duties of the Chief of Naval Operations until a successor is appointed or the absence or disability ceases. The CNO also performs all other functions prescribed under 10 U.S.C. § 5033, such as presiding over the Office of the Chief of Naval Operations (OPNAV), exercising supervision of Navy organizations, and other duties assigned by the Secretary or higher lawful authority, or the CNO delegates those duties and responsibilities to other officers in OPNAV or in organizations below. Acting for the Secretary of the Navy, the CNO also designates naval personnel and naval forces avaliable to the commanders of Unified Combatant Commands, subject to the approval of the Secretary of Defense. The CNO is a member of the Joint Chiefs of Staff as prescribed by 10 U.S.C. § 151 and 10 U.S.C. § 5033. Like the other members of the Joint Chiefs of Staff, the CNO is an administrative position, with no operational command authority over the United States Navy forces. Members of the Joint Chiefs of Staff, individually or collectively, in their capacity as military advisers, shall provide advice to the President, the National Security Council (NSC), or the Secretary of Defense (SECDEF) on a particular matter when the President, the NSC, or SECDEF requests such advice. Members of the Joint Chiefs of Staff (other than the Chairman of the Joint Chiefs of Staff) may submit to the Chairman advice or an opinion in disagreement with, or advice or an opinion in addition to, the advice presented by the Chairman to the President, NSC, or SECDEF. When performing his JCS duties, the CNO is responsible directly to the SECDEF, but keeps SECNAV fully informed of significant military operations affecting the duties and responsibilities of the SECNAV, unless SECDEF orders otherwise. The Chief of Naval Operations is nominated by the President for appointment and must be confirmed by the Senate. A requirement for being Chief of Naval Operations is having significant experience in joint duty assignments, which includes at least one full tour of duty in a joint duty assignment as a flag officer. However, the president may waive those requirements if he determines that appointing the officer is necessary for the national interest. By statute, the CNO is appointed as a four-star admiral. Number One Observatory Circle, located on the northeast grounds of the United States Naval Observatory in Washington, DC, was built in 1893 for its superintendent. The Chief of Naval Operations liked the house so much that in 1923 he took over the house as his own official residence. It remained the residence of the CNO until 1974, when Congress authorized its transformation to an official residence for the Vice President. The Chief of Naval Operations currently resides in Quarters A in the Washington Naval Yard. 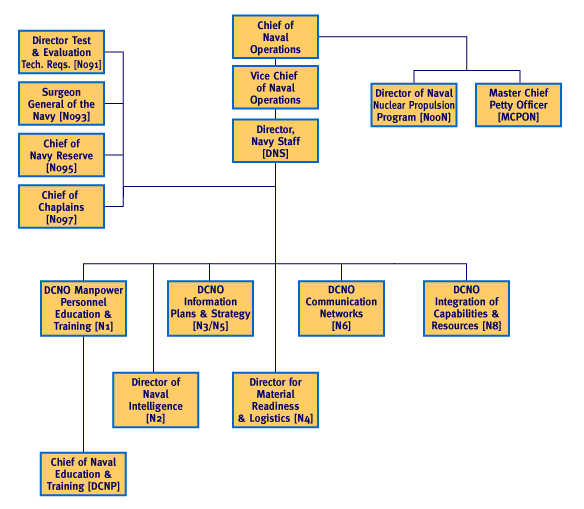 Organizational chart of the Office of the Chief of Naval Operations (OPNAV). The Chief of Naval Operations presides over the Navy Staff, formally known as the Office of the Chief of Naval Operations (OPNAV). The Office of the Chief of Naval Operations is a statutory organization within the executive part of the Department of the Navy, and its purpose is to furnish professional assistance to the Secretary of the Navy (SECNAV) and the CNO in carrying out their responsibilities. The Vice Chief of Naval Operations (VCNO), the principal deputy of the Chief of Naval Operations, delegated complete authority to act for the CNO in all matters not specifically reserved by law to the CNO. The Director of the Navy Staff (DNS). Several Deputy Chiefs of Naval Operations (DCNOs) of either three or two-star rank, heading functional directorates. (N00D) The Master Chief Petty Officer of the Navy (MCPON), appointed by the Chief of Naval Operations to serve as a spokesperson to address the issues of enlisted personnel to the highest positions in the Navy. 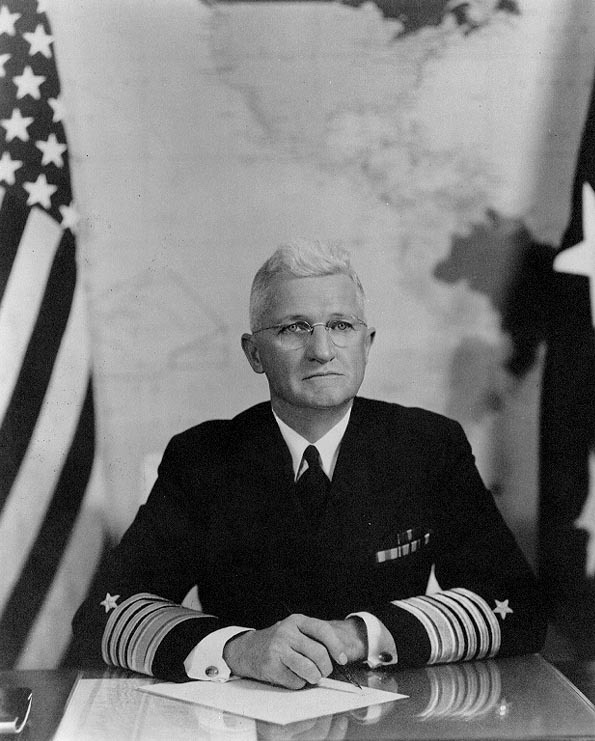 (N00N) The Director of the Naval Nuclear Propulsion Program, a unique eight-year posting held by a 4 star admiral, which was originally created and served in by Admiral Hyman G. Rickover. The appointment as Director is both a military and civilian position as it is the head of both Naval Nuclear Propulsion Program in the Department of the Navy and National Nuclear Security Administration in the Department of Energy. (N093) The Surgeon General of the Navy, the most senior officer in the Medical Corps who heads the Bureau of Medicine and Surgery (BUMED). (N095) The Chief of Navy Reserve/Commander, Navy Reserve Force. (N097) The Chief of Chaplains. (N09C) Special Assistant for Public Affairs Support, additional duty for the Chief of Information (CHINFO). (N09G) Special Assistant for Inspection Support, additional duty for the Naval Inspector General (NIG). (N09J) Special Assistant for Legal Services, additional duty for the Judge Advocate General of the Navy (JAG). (N09L) Special Assistant for Legislative Support, additional duty for the Chief of Legislative Affairs (CLA). (N09N) Special Assistant for Naval Investigative Matters and Security, additional duty for the Director of the Naval Criminal Investigative Service. Policy documents emanating from the CNO are issued in the form of OPNAV Instructions. OPNAV is one of the three headquarters staffs in Department of the Navy mainly based at The Pentagon, with the others being the Office of the Secretary of the Navy and Headquarters, Marine Corps. The position of CNO replaced the position of Aide for Naval Operations, which was a position established by regulation rather than statutory law. ↑ 1.0 1.1 "Chief of Naval Operations". United States Navy. http://www.navy.mil/navydata/leadership/cno_resp.asp. Retrieved 31 January 2018. ↑ "10 USC 5035. Vice Chief of Naval Operations". Cornell University Law School. https://www.law.cornell.edu/uscode/text/10/5035. Retrieved August 25, 2018. ↑ "10 USC 5033. Chief of Naval Operations". Cornell University Law School. https://www.law.cornell.edu/uscode/text/10/5033. Retrieved August 25, 2018. ↑ 6.0 6.1 6.2 6.3 "10 USC 5033. Chief of Naval Operations". https://www.law.cornell.edu/uscode/text/10/5033-. Retrieved 24 September 2007. ↑ "The Vice President's Residence". The White House. Archived from the original on 21 October 2009. https://web.archive.org/web/20091021225638/http://www.whitehouse.gov/about/vp_residence/. Retrieved 31 January 2018. ↑ navy.mil Archived 22 July 2011 at the Wayback Machine. Chief of Naval Operations − Responsibilities. Retrieved 3 July 2010. ↑ "10 U.S. Code § 5033 - Chief of Naval Operations: general duties". Cornell University Law School. https://www.law.cornell.edu/uscode/text/10/5033. Retrieved August 25, 2018. ↑ "10 U.S. Code § 5031 - Office of the Chief of Naval Operations: function; composition". Cornell University Law School. https://www.law.cornell.edu/uscode/text/10/5031. Retrieved August 25, 2018. ↑ "10 U.S. Code § 5032 - Office of the Chief of Naval Operations: general duties". Cornell University Law School. https://www.law.cornell.edu/uscode/text/10/5032. Retrieved August 25, 2018. ↑ "National Nuclear Security Administration". National Nuclear Security Administration, Department of Energy 2009. Department of Energy www.Energy.gov. Archived from the original on June 5, 2009. https://web.archive.org/web/20090605032246/http://nnsa.energy.gov/naval_reactors/. Retrieved 14 August 2009. ↑ "Navy - Chief of Naval Operations". June 1915. p. 68. https://books.google.com/books?id=IAU8AQAAIAAJ. Retrieved 21 May 2015. Wikimedia Commons has media related to Category:Chiefs of Naval Operations. "Chief of Naval Operations". 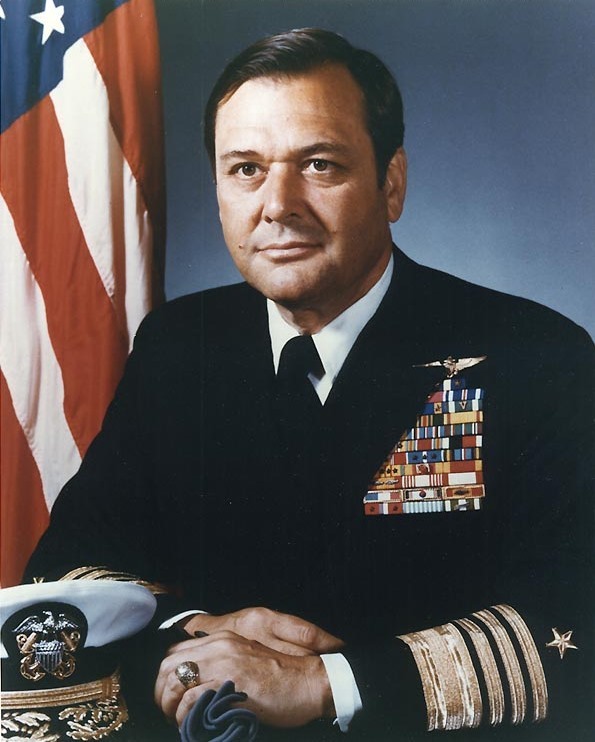 Lists of Commanding Officers and Senior Officials of the US Navy. Naval Historical Center. Archived from the original on 18 December 2007. https://web.archive.org/web/20071218005946/http://www.history.navy.mil/faqs/faq35-1.htm. Retrieved 6 November 2007.